The 2016 Sunshine Fiddle Camp is happening once again on the beautiful Sunshine Coast of Queensland at Alexandra Headlands. between January 10th and 15th, 2016. This year the camp will have two international tutors Brittany Haas and Tristan Clarridge both formerly of the seminal US band Crooked Still. They’re joining Australian teachers Jack Wilson and Jeri Foreman plus more. Places are filling up fast, but there are still limited spots left. The Sunshine Fiddle Camp is a place where all are welcome to come and develop their skills across a variety of musical genres, including Scottish, Bluegrass and Old Time music. The world-class tutors all have experience in performance, composition, arranging and improvisation. The camp is tailored towards fiddles and cellos, however all instruments are welcome. Or spend some time on their Facebook page. The 2014 Sunshine Fiddle Camp is scheduled for 24th to 29th Sep. at the Alexandra Park Conference Centre. A class just for the kids. if you started the Violin a long time ago, or just always wanted to play the fiddle, here is your chance. A beginner class that will get you started or restarted on the fiddle. 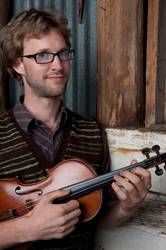 Casey Driessen has spent his career pushing the boundaries of fiddle music. With the release of his third album, The Singularity, the 34- year old virtuoso proves that the possibilities of one man, one five-string fiddle, and one pedal board are endless. The Singularity, Driessen’s third record, is a solo album in every sense of the word the only sounds listeners hear are created by the looping of fiddle and voice. It was self recorded and self- produced at his home studio. In between touring with The Flecktones, Tim O’Brien, and Darrell Scott, and opening for the Zac Brown Band. 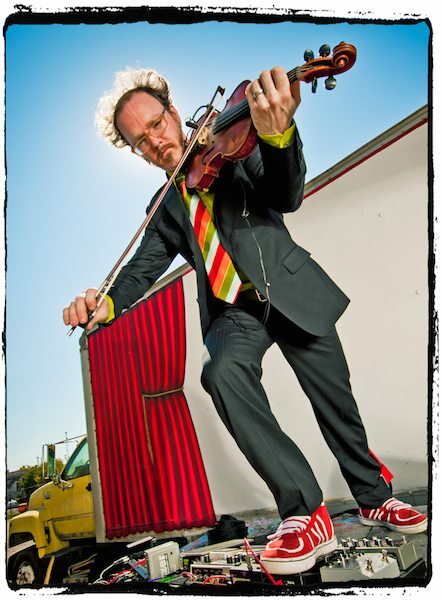 The Grammy-nominated Driessen has participated in several genre-blending ventures, including Bela Fleck and Abigail Washburn’s Sparrow Quartet, at his core, he is a bluegrass fiddler, albeit one who honed his skills at Berklee College of Music. Ariel Friedman is a multi-genre trailblazing cellist, and one of few musicians to be challenging the boundaries of cello-playing. She graduated with a Masters of Music in Contemporary Improvisation from New England Conservatory in 2011. A winner of ASTA’s 2009 Alternative Styles Award, Ariel is steeped in the music of American roots traditions, early jazz and a broad range of classical repertoire. She performs regularly with her sister as Boston’s Americana sister act “Ari and Mia”, Ari has also toured internationally with Scottish National Fiddle champion Hanneke Cassel, has performed with the Boston Symphony group “Classical Tangent,” and maintains a solid footing in the classical world. She is a sought after educator and has taught at music camps and programs from New England to New Zealand. Jackson is the 7th generation fiddler in his family. His passion for music is inspired by the contrasting styles of Bluegrass, Old-time, Celtic. Jackson’s own style spans from the traditional to the innovative. 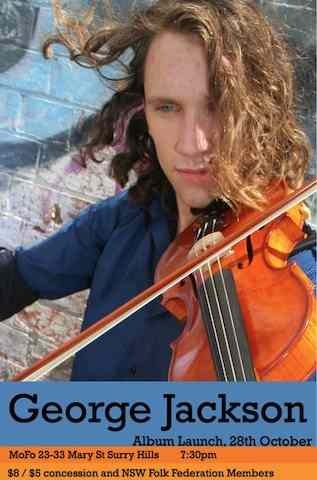 George has been awarded the Golden Fiddle Award for “Best Fiddler”, The Australian Youth Bluegrass Scholarship and has Won the CMAA Australian Fiddle and Banjo Championships along with the FAA Young Australian Folk Musician in 2010. Visit the Sunshine Fiddle Camp Website. 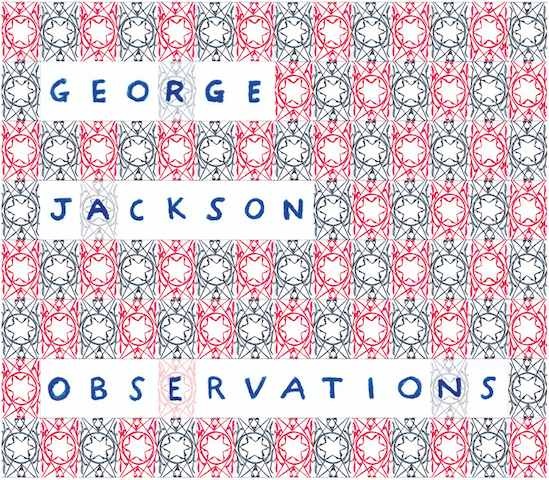 Observations is the brand new EP of instrumental tunes by George Jackson released April 2014. This 5-track exploration ties up George’s most ambitious solo undertaking so far that brings together the tide of influences throughout his musical career. These range from celtic to jazz with the ever underlying grounding in bluegrass and old-time. All 5 pieces on the EP are written by George under the guidance and mentorship of master US fiddler Casey Driessen. This EP is the culmination of a year-long mentorship facilitated by the Australia Council for the Arts “JUMP” mentorship program – an amazing opportunity that saw George travel to North Carolina to study with Casey during the US summer of 2013. In August of 2013 George called together three of his favorite, like-minded young musicians and friends in David Goldenberg, Andrew Small and Jake Stargel to bring to life the music that was taking shape throughout the mentorship. After one demanding 12 hour Asheville recording session on the 27th of August, these 5 tracks emerged and were expertly mixed and mastered by Casey himself. The Artwork was conceptualised by George and brought to life by a Melbourne based friend and musician/artist Pepita Emmerichs. It features a sketched outline of the iron grille from George’s own balcony tiled and tessellated, echoing the title of the 5th track “Observations From My Balcony”, and subsequent name of the album. Stream, download or order “Observations” on BandCamp or from our ABB Shop. More about George Jackson on his website. Bluegrass and Old-Time Music – 16th Feb.
Glasshouse Musician’s Club has announced that they are hosting an afternoon concert featuring two of the most exciting young folk groups this country has to offer on Sunday the 16th of February, 3pm. The two bands, One Up, Two Down, and Oh Pep! have very contrasting and complimentary approaches to their music, and all six musicians are tight friends. So how did this collaborative tour come together? 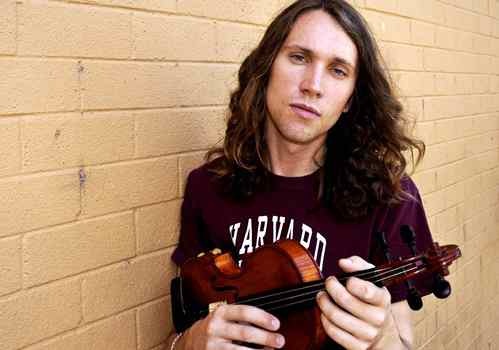 It starts back in 2012 when George Jackson, a NZ born fiddler living in Australia, was at a music camp in Florida to spend a week learning from some of the best fiddle tutors in the US. Another student at the camp that week was a prodigious young double bassist from North Carolina named Andrew Small, and it wasn’t long before these two musicians from opposite ends of the globe formed a friendship and began hatching a plan to start a band and get touring. A few weeks later, George and Andrew flew to California to attend a second music camp and it was there that they met up with Melbourne fiddler Pepita Emmerichs and the tour really began to began to take shape. 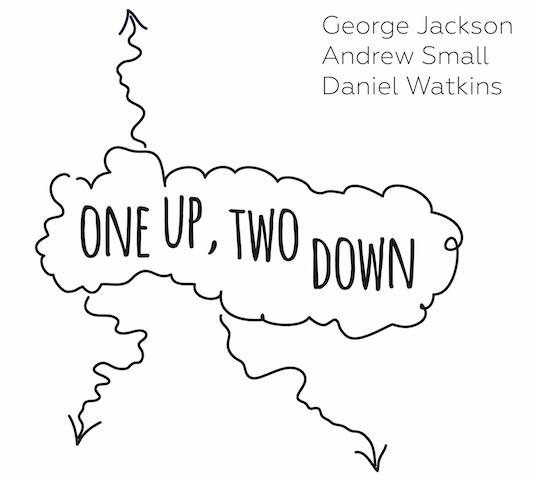 A year and a half later, we have One Up, Two Down, George and Andrew’s band with Australian singer and guitarist Daniel Watkins, who recently recorded their debut EP in Nashville September of 2013. Joining forces with Pepita’s award winning pop/folk band Oh Pep! who Andrew is performing with also. Oh Pep! are musical explorers who travel in the form of a band; a collaboration between songwriters Olivia Hally (guitar, vocals) & Pepita Emmerichs (fiddle, mandolin), along with drummer Justin Olsson. Drawing upon their escapades, they take you on a carefully arranged folk/pop adventure for your ears. One Up Two Down hail from three countries joined by the Pacific Ocean, George Jackson (NZ), Andrew Small (USA) and Daniel Watkins (AUS) bring together raw old-time power, bluegrass dexterity and rare gems from the American folk song tradition. This trio draws on a strong grounding in old-time and bluegrass music, extending their music to new compositions with far wider influences. Filed Under: Events Tagged With: Daniel Watkins, George Jackson, Oh Pep! One Up Two Down hail from three countries joined by the Pacific Ocean, George Jackson (NZ), Andrew Small (USA) and Daniel Watkins (AUS) bring together raw old-time power, bluegrass dexterity and folk story telling. This trio draws on a strong grounding in old-time and bluegrass music, extending their music to new compositions with far wider influences. These three lean lads are armed with some exciting music, which they recently recorded in Nashville Tennessee and have just released this music on their debut EP. Andrew is a North Carolina native Double Bassist, Yale School of Music masters graduate who is immersed in the American Old-time and Bluegrass music scene. George is the 7th generation in a line of New Zealand fiddlers dating back to the first settlers. Daniel Watkins is a strong vocalist and encyclopedia of songs which he masterfully flat-picks on his guitar hailing from Newcastle. George and Dan are the back to back winners of the Australian Youth Bluegrass Scholarship (2012, 2013). Oh Pep! 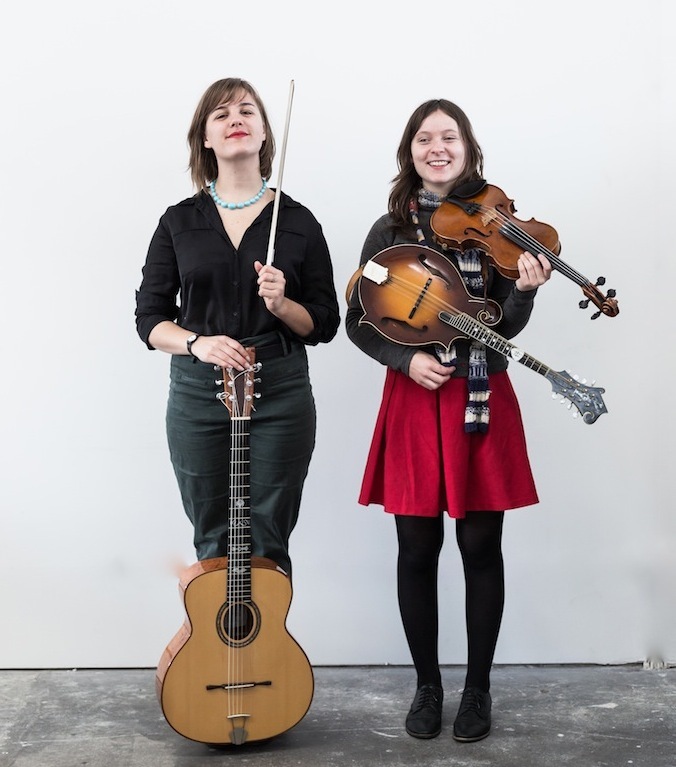 are musical explorers who travel in the form of a band; a collaboration between songwriters Olivia Hally (guitar, vocals) & Pepita Emmerichs (fiddle, mandolin). Drawing upon their escapades, they take you on a carefully arranged folk/pop adventure for your ears. Originally based in Melbourne, Oh Pep! have travelled endless kilometers performing their songs and when they’ve been stationary their songs have travelled further via the airwaves of national radio. It was just last year that Oh Pep! were featured on Amrap’s AirIt Great Southern Charts ‘Top Ten Tracks Most Ordered For Airplay’ alongside Sarah Blasko, Boy & Bear and Kutcha Edwards. After launching into the Australian music scene with their first EP, they spent a week by the beach recording with ARIA-Award Winner and CMAA Producer of the Year, Shane Nicholson and have since launched their second EP, II, with a national tour. Now joined by accomplished musicians, Justin Olsson (drum kit) and international guest, Andrew Small (double bass), Oh Pep! will have you travelling far & wide for a sometimes foot-stomping, somewhat heartbreaking show. Thu. 6th Feb – Retreat Hotel, Brunswick, VIC. 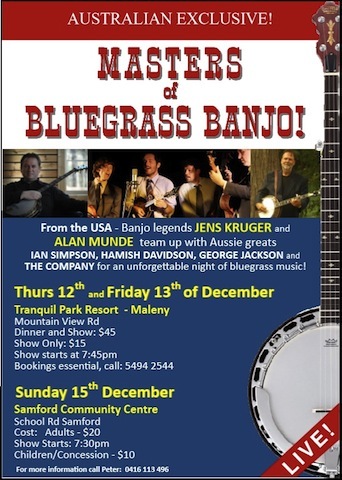 Filed Under: Australian Bluegrass News, Events Tagged With: Daniel Watkins, George Jackson, Oh Pep! We have just received news that USA bluegrass band The New Worlds will be returning to Australia in October this year. The members of The New Worlds are some of the hottest young players in the USA currently and will be in Australia for a limited time performing at a few festivals. The band is seeking to fill a few free dates while in Sydney between Monday the 15th and Thursday the 18th of October and are looking to organise a Sydney performace before they head to the JamGrass Festival in Melbourne, then a short tour of NZ before playing at the Dorrigo Folk and Bluegrass Festival. Here’s an opportunity for someone to take up the challenge and present this young band at your local hotel, a house concert or even a gig in the local hall. Below is some information regarding The New Worlds and this link to some recently some of their recorded tracks. The New Worlds consist of: David Goldenberg: mandolin, Shelby Means: bass/vocals, Frank Rische: vocals/guitar, Christian Sedelmyer: fiddle/vocals. They are an American string band rooted in bluegrass, old time, and classic country music with a folk rock undertone. They will be touring Australia and New Zealand in October 2012. Touring with The New Worlds will be support act featuring George Jackson on fiddle and banjo, and guitarist and singer Daniel Watkins. See their YouTube clip below. 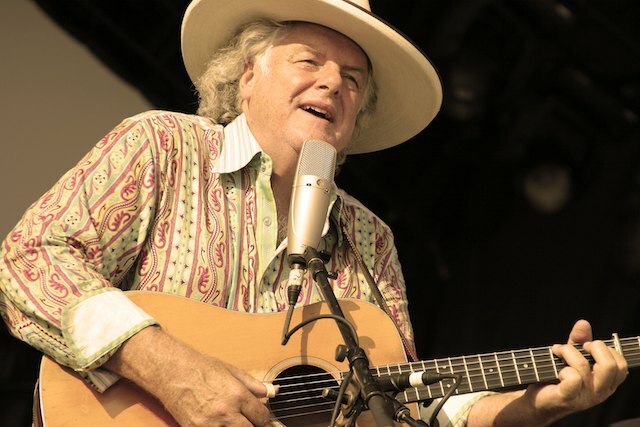 go-to guy for Bluegrass Guitar and for his passionate strong lead vocals. If you are interested in having The New Worlds/George Jackson and Daniel Watkins perform or would like some more information please contact George via email or on mobile 0466 423 848. 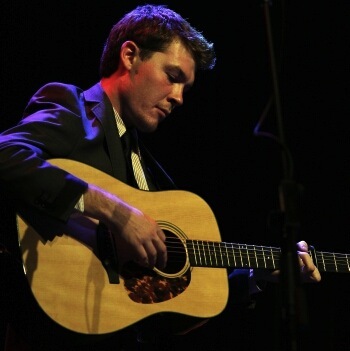 The Davidson Brothers and Pacific International Music have extended their congratulations to 22-year-old George Jackson who has taken out the inaugural Australian Youth Bluegrass Scholarship. George fell in love with bluegrass when he heard Bela Fleck’s Drive album at the age of 14. His family moved to Queensland from New Zealand when he was 16. 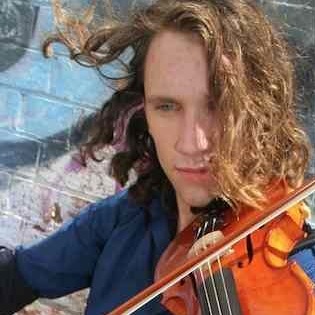 He has notched up 3 Australian Bluegrass Championships (2 on fiddle and 1 on banjo) as well as being awarded the FAA Young Folk Musicians Award in 2010. George plays fiddle and banjo, and is confident across many genres, although his heart clearly lies in bluegrass. George is going to put his $1,500 prize money towards flights to the US so he can further study bluegrass music and immerse himself in the scene. George sets a high standard for himself musically and we know he will also make the most of the recording package offered by Pacific International Music. The Davidson Brothers have also given an honourable mention also to 12-year-old Taylor Pfeiffer of South Australia. She is doing incredibly well on the banjo and has an incredibly bright future in bluegrass.